OKLAHOMA CITY, Okla. — Midway through a the third quarter of a blowout 121-96 Oklahoma City Thunder (19-10) victory over the Chicago Bulls (7-24), four technicals were called. Russell Westbrook committed a foul after shoving Kris Dunn. Dunn retaliated with a more aggressive shove to Westbrook. 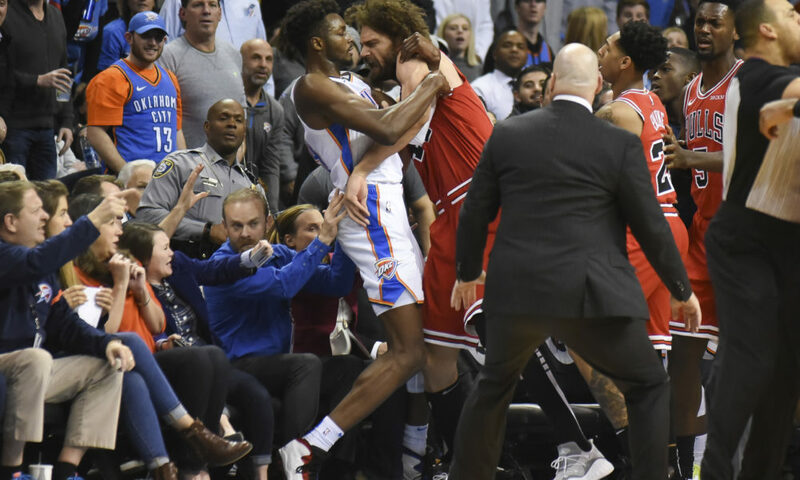 After that, both teams met in front of the Thunder bench before Robin Lopez attempted to force Jerami Grant into some court side fans sitting near by. A chaotic scene that resulted in four technicals assessed to Westbrook, Grant, Lopez and Dunn. “Next question,” Westbrook said in the locker room when asked about the skirmish. There were six technicals called in the entire game. Despite the ugly scene, the Thunder avenged one of their worst losses of the season last week when they failed to finish in Chicago. Oklahoma City did a great job closing their quarters to extend a lead the Bulls were never able to threaten. After leading 31-22 at the end of the first quarter — where the Thunder closed on a 21-7 run — sloppy play began to plague Oklahoma City. After a Dunn layup, the Bulls got within two at 39-37. From there the Thunder went on a 25-7 run and kept Chicago down for good. Paul George was spectacular in the second. The Thunder’s best player so far this year continued his magnificent play by shooting a perfect 6-for-6 in the second quarter, finishing with 14 points. He was also 3-for-3 from downtown. Oklahoma City needed it too. The rest of the Thunder in the pivotal quarter before halftime shot a combined 5-for-14 and committed four turnovers. Surprisingly, George only scored one more point the rest of the way on a technical free throw. Westbrook appeared to have his best game in terms of shooting in the last few games. After starting 0-for-2 which included a midrange air ball, Westbrook rebounded with two coast-to-coast layups on the fast break. He finished 5-of-13 from the floor but overall looked like he is beginning to regain his feet under him which will only improve his shooting. With 16 rebounds and 11 assists, he also registered his 111th triple-double. The Thunder now move on to Sacramento on the road in their third game against the Kings this season. Oklahoma City is 0-2 in the season series, losing one each at home and on the road.